SUMMARY: We report 2 patients with aggressive intracranial dural arteriovenous fistulae that were repaired via percutaneous, transarterial coil embolization of the venous outlets. 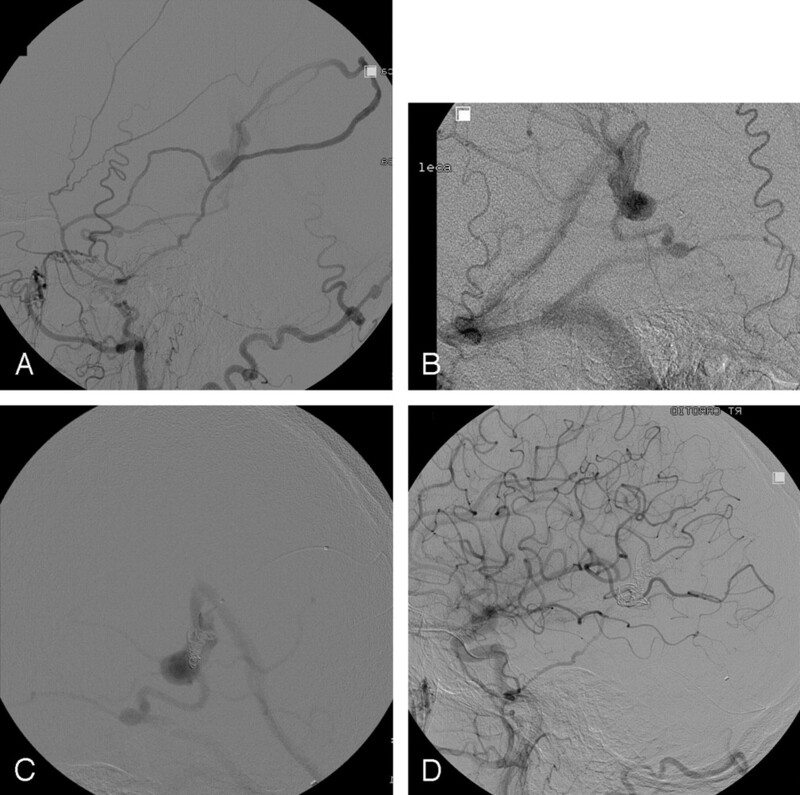 Typical endovascular treatment options for aggressive dural arteriovenous fistulas (dAVFs) include transvenous coil embolization, transarterial glue embolization, and transarterial particulate embolization.1–4 We consider dAVFs to exhibit aggressive behaviors when they present with cortical venous drainage, hemorrhage, or increased intracranial pressure. Where possible, retrograde, transvenous occlusion of the most proximal venous outlet represents the ideal endovascular option for curative treatment of aggressive dAVFs. Coil embolization of the venous outlet, when feasible based on access routes, is safe and highly efficacious in achieving complete cure. Transarterial glue embolization, with deposition of glue into the collecting vein, may also result in cure, but is less controllable than coil embolization and thus may be of higher risk. Transarterial particulate embolization typically is not curative. Transarterial access into the venous outlet of a dAVF has been reported in one case, that of a benign dAVF.5 We report 2 cases of aggressive dAVFs that were obliterated with the use of transarterial coil embolization of the proximal venous outlet and offer this therapy as a useful alternative to other endovascular approaches. A 55-year-old man presented with a 6-week history of right-sided trigeminal neuralgia. 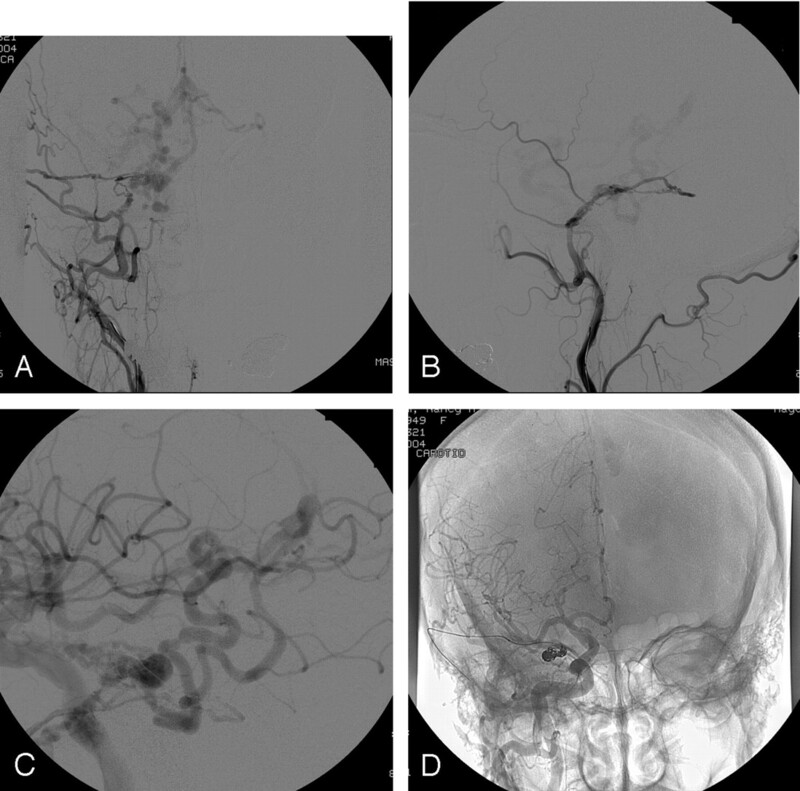 MR imaging and angiogram at an outside institution showed a dAVF along the tentorial edge fed predominantly via the right meningohypophyseal trunk (MHT) and inferolateral trunk (ILT) and the posterior division of the middle meningeal artery, with a markedly tortuous venous outlet to the deep venous system (Fig 1A, -B). A, Right common carotid artery injection demonstrates massively enlarged inferolateral and meningohypophyseal trunks feeding a tentorial dural arteriovenous fistula (dAVF). This dAVF is also supplied by multiple external carotid artery (ECA) feeding vessels, including the petrous branch of the middle meningeal artery and the posterior division of the middle meningeal artery. The collecting pouch in the region of the tentorium drains into multiple cortical veins toward the midline to the deep venous fistula. Multiple cortical veins drain this fistula. The eventual emptying site is along the transverse sinus. B, Right external carotid angiography demonstrates the course of the middle meningeal artery with supply to the fistula by the posterior division. C, Right common carotid angiography demonstrates the microcatheter coursing through the posterior division of the middle meningeal artery with the tip in the venous pouch. D, Right common carotid artery (CCA) injection after coil-embolization demonstrates no further fistula flow. Note course of microguidewire in the middle meningeal artery. When the patient was brought to the angiography suite, the intention was to perform a presurgical embolization, limited to particulate embolization of the arterial feeders. We considered retrograde, transvenous access impossible, given marked tortuosity of the draining veins. We also considered glue embolization for cure to be difficult in this case, because most of the arterial supply was via the MHT and ILT. The patient was systemically anticoagulated to an activated clotting time (ACT) >250 s. A 6F sheath was placed in the left common femoral artery and a 6F Envoy catheter (Cordis Neurovascular, Miami Lakes, Fla) was advanced into the right internal carotid artery (ICA). 3D rotational angiography was performed. We made an unsuccessful attempt to enter the MHT and ILT with the use of a microcatheter. We then placed the guiding catheter tip into the right external carotid artery (ECA). Using coaxial technique, an Echelon 10 microcatheter (Micro Therapeutics, Irvine, Calif) was advanced over a Mirage guidewire (Micro Therapeutics) into the middle meningeal artery. We then placed the catheter in the posterior division of the middle meningeal artery. By using a combination of the Mirage wire as well an X-Pedion 14 guidewire (Micro Therapeutics), we were able to advance the catheter tip through the arterial system into the venous pouch (Fig 1C). The venous pouch was packed with platinum microcoils (Micrus MicroCoil System; Micrus, San Jose, Calif, and Helix SuperSoft TS from MicroTherapeutics). Control angiography showed occlusion of the fistula (Fig 1D). Follow-up angiography at 2 months showed no evidence of dAVF. A 66-year-old woman presented with episodic vision loss lasting for several seconds. An MR imaging/MRV demonstrated a dAVF centered in the region of the vein of Galen, with an associated venous varix (Fig 2A, -B). Sheaths were placed in the right common femoral artery and left common femoral vein. Using coaxial technique, a Tracker 38 catheter (Boston Scientific, Natick, Mass) was placed into the right transverse sinus. Through this catheter we advanced an Echelon 14 microcatheter into the straight sinus and then into the venous varix. We hoped to achieve access into the fistula site, which was approximately 2 cm cephalad to the varix, to allow selective packing of the fistula site without need for packing of the downstream varix. We considered that packing of the fistula site rather than the varix would not only allow more rapid closure with fewer coil devices but also diminish any potential for mass effect on the adjacent tectum from the coil mass; however, we were unable to advance the catheter retrograde beyond the varix into the fistula site. We then placed an Echelon 10 microcatheter through a 6F Envoy catheter into the middle meningeal artery, by using a combination of a Synchro 14 microguidewire (Boston Scientific) and an X-Pedion 14 guidewire to place the microcatheter into the proximal venous pouch of the dAVF (Fig 2C). We then packed the venous pouch with a combination of platinum coils (Micrus Microcoil System and Cordis Trufill, Cordis Neurovascular) and Hydrocoils (HydroCoil Embolic System, MicroVention, Aliso Viejo, Calif). As a precaution, we placed a single platinum coil into the large collecting pouch distal to the coils in case of coil migration. Control angiography showed occlusion of the fistula (Fig 2D). A, Right external carotid angiography demonstrates supply to the fistula via an enlarged posterior division of the middle meningeal artery. B, Lateral digital subtraction angiogram (DSA) of left external carotid artery shows venous outlet of dural arteriovenous fistula in the region of the vein of Galen. Proximal collecting pouch is cephalad to the vein of Galen. A venous varix is present downstream from the proximal collecting pouch. C, Lateral DSA with microcatheter placed via the right middle meningeal artery into the proximal collecting pouch. D, Final control DSA showing coil position and occlusion of the fistula. Tokunaga et al.5 described a single case of transarterial coil embolization of a venous pouch in a dAVF. That previously reported case was a benign dAVF in which the fistula was located relatively proximally along the posterior division of the middle meningeal artery. The fistula locations in our 2 cases required extremely distal access within the middle meningeal arteries. Achieving such distal access may be related to advances in microcatheters and may become more common in the future. These 2 cases represent the feasibility of performing coil embolization of the venous outlet of dAVFs from a transarterial approach. In selected cases, this technique may offer substantial advantages over other endovascular approaches. In lesions where the morphology of the venous outlet precludes retrograde, transvenous coil embolization, transarterial particulate or glue embolization might be considered; however, particulate embolization is unlikely to effect a cure. Glue embolization may cure such lesions, but achieving glue deposition into the venous outlet may be technically challenging, in light of the uncontrolled nature of glue deposition. Transarterial coil occlusion of the venous outlet, as in the 2 cases described here, offers a highly controlled, safe alternative to glue embolization and still achieves a cure.